For sale. – Dirty wet dog , boats and sailing. 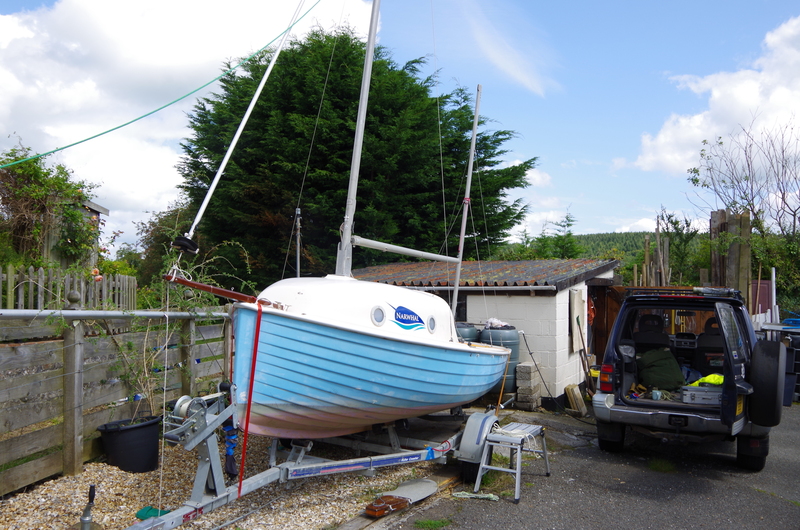 I am putting the Devon Dayboat up for sale because i am having real difficulty working on the refit project and honestly can’t see any way that i am likely to complete it. I will deal with the problem side first briefly and then get on and talk about the boat. The problem is joint related, i seem to have rapid deterioration in one knee and i’m not so sure about the other one. I suspect that i need a knee replacement. What this means for me is that it has become increasingly difficult to do any work while kneeling and it’s almost impossible to avoid that with this project. Ok so onto the boat. I bought Narwhal last year with the intention of having a long term boat that i could keep at home thus reducing my sailing costs. I did a series of posts about finding a boat like the Dayboat and this one came at about the right time. I was prepared to do a complete refit which i thought the boat needed and had plans to convert the basic boat into a small ‘Raid’ style adventuring boat and most likely with a different rig. For better or worse i have done hardly any work on the project because of the problems i have run into. I am going to carry on doing the jobs that i have already started eg the new rudder. The best way of showing the boat is with many of the photographs that i took before and after i bought her. Currently she is sitting on her trailer in my drive in East Cornwall. She has the gear that came with her plus some bits and pieces that i have done so far. Its a GRP hull which looks sound, the gelcoat is chalky and either needs a hard cutting compound or a re-paint. There isn’t much inside the boat, i have finished hacking the foam out of the side tanks and added a henderson hatch each side. I have done most of the work to build a new rudder as i had a suitable wooden blade lying around which is about the right size and a much better shape than the original which is still here. I have kept the old rudder stock and metal blade, photographed with the new blade in the slide show. The rig that came with the boat is still here and untouched. I do have the mast that and boom that i was intending to use which is lighter and much more like the section that the Yawl’s use today. That mast came off a 17′ trapeze dinghy and as far as i can tell would be a strong enough section although it will need cutting to size. The original masts are heavy but i did get the mainmast up with my partner helping me. There is some damage at the base of the original mainmast and i think the tabernacle needs replacing. The sails that came with the boat are pretty old and i was going to replace them once i had a feel for the boat. The engine is the one that came with the boat, i had it running just after i bought the boat but haven’t run it since then. There is a small amount of additional new gear, i have fitted the Henderson Hatches , i have a bilge pump and pipework for the boat and put an anchor aside for her. I have never sailed the boat so i can’t comment on that. The trailer looks to be in very good condition : it’s an indespension i beleive. I am putting her up for the same asking price (£3000) as when i bought her as essentially she is the same boat and not messed about with as some feared. I bought her from a DY association member last year. Contact me through the website, my email address (steve1gunnislake@gmail.com) or leave a message on our home no 01822 834042.